The concept of flat rate pricing has been around for centuries. The idea is simple - I do a certain job for you, you pay me a set amount for the job. The exchange isn’t dependant upon the material that I use, nor does it matter how long it takes to perform the job. Flat rate pricing, while simple in concept, can result in sizable profits. Though flat rate pricing has been around for hundreds of years, irrigation businesses are just starting to see its benefits. It can save you headaches with customers, since you no longer need to explain why a certain job took X amount of time to perform and why you had to use Y parts. You simply bill them for the type of job you’re working on. In its earliest stages, tradesmen such as auto mechanics would use flat rate pricing to charge for their work. They would calculate the average cost of materials for their work, factor in markup, find out the average time it would take to perform their work and set their price. Since the earliest days of flat rate pricing, different industries have developed their own standards. Mechanics have books they use for pricing their repair work, HVAC professionals have standards to help them charge a standard rate on heating and air conditioning systems. “Auto mechanics and HVAC repairmen have been around as long as there has been cars and furnaces”, said David Crary, Founder of HindSite Software. “But the green industry is still young in comparison. Modern irrigation systems have only been around for about 30 years, so it is a relatively young trade”. Because of that, there aren’t the same type of standards that have been developed for the green industry yet. In practice, flat rate pricing can be a profitable pricing strategy for irrigation businesses. However, it needs to make sense for the type of work you’re performing and it it should be implemented with knowledge of all the components of your business. You need to know EXACT costs on your parts and your labor. You use this to factor into your average cost of performing a particular job. You’ll have to figure out how much it costs you to perform a certain task, like a sprinkler head replacement, build in your necessary margins and then set that price as your flat rate price for that job category. The goal is to have your field techs perform the task with the goal of hitting the time frame you estimated. If they can continuously beat the estimated time that you set for the type of job, they’re making the flat rate model profitable. Where it differs from time and material is that you aren’t charging for each individual part that you’re using. If you replace a sprinkler head, you might also have to change out a valve which involves more parts than just the head. But, there are times when you’ll only have to replace a head. That is added margin to your bottom line if you’re using a flat rate model. So in order to make it profitable, you want to keep your parts used to perform a job lower than what you normally need on the average fix and you want to have your techs on the job as little time as possible. With flat rate pricing, one irrigation tech might be able to fit 10 hours of billable work into a normal 8 hour work day, all adding to your profit. Each individual package will contain numerous parts, but they are unique to the repairs, installations and service that you might be providing. And while you have a number of different parts in each package, that doesn’t mean you’re going to need to use each part for the job you’re performing. For instance, you might be called out on a valve repair and only have to replace a couple of bad gaskets. You’ll also need to identify the time that your techs are spending on the job. How long is it taking them to perform these jobs? The easiest way to do this is if you have irrigation business software that you use to track time and activity. You’re able to assign a dollar value to the time that each tech spends on a repair, installation or other services. Using those known times, you can package both your parts and your times into a flat rate price per job. You can use a flat rate price for a part installation, a sprinkler head repair and much more that you do on a daily basis. Software can help make a flat rate pricing model even more profitable. An irrigation software gives you the ability to track everything from start to finish. As a field tech, being able to track your time and parts used can make your job a whole lot more efficient. All the information that you need is at your fingertips on a mobile device or a tablet. On the office side, you’re able to see whether or not those field techs are performing their work within the designated time that you built into your flat rate price. Software gives you the means to perform and measure flat-rate pricing well. A flat rate pricing model might actually mean some of your customers will be paying more for work than they would be if you charged time and material on some jobs. However, that doesn’t necessarily mean that you’re turning customers away. Flat-rate can be appealing to customers because they know exactly what they’re getting into for cost. Many customers have a distrust for technicians that are paid hourly. They feel that service technicians might “take their time” on jobs, thus charging a higher rate for their services. Instead, they would rather pay what could potentially be more money had they used a time and material service contractor, just so they have the peace-of-mind that they aren’t going to be charged for unexpected extra time spent on the job. Flat rate pricing isn’t a frequently used model within the green industry. Like mentioned before, the industries that pioneered this model have been around for hundreds of years, the green industry has not. However, if done well - using data and tracking your business's activity - it can be more profitable than time and material pricing. It can even become an advantage within your competitive market, leading to more and more long term customers. 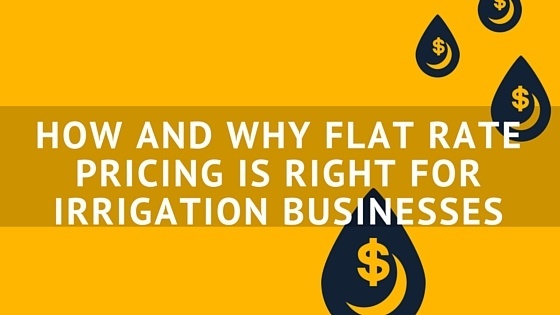 Want to learn about what software can do to make flat rate pricing a profitable practice? Download a free copy of your eBook today!